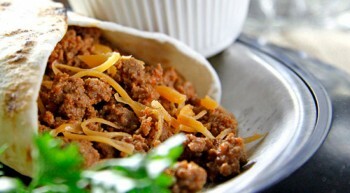 Vanee Beef Taco Filling is a solid pack of ground beef, seasoned with tomatoes, onions, spices, and Tabasco® for extra kick. 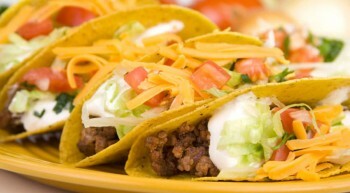 Great for taco applications, taco salads, and nachos. 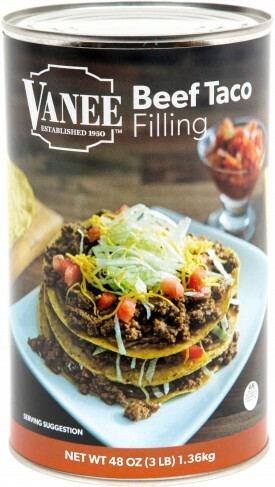 Vanee Beef Taco Filling frees up valuable freezer space by being shelf-stable, is consistent between batches, comes in a convenient 6/48 oz. pack size, and is heat-and-serve for ultimate back-of-house simplicity. Each 48 oz. can has 23 third-cup servings, for 138 total servings in a case. 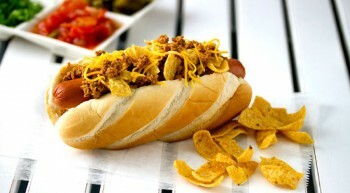 Great for tacos, taco salads, and nachos. Cooked Ground Beef, Water, Textured Soy Concentrate (Caramel Color added), Salt, Hot Sauce (Distilled Vinegar, Red Pepper, Salt), Spices, Dehydrated Onion, Sugar, Onion Powder, Garlic Powder.